composite, 2 layers, closed pocket, velcro, reinforced palm, comfortable thanks to its very soft interior, very resistant to abrasions thanks to its double polyurethane layer. Homerun 26 Inch Baseball Bat, Ball and Glove Set. 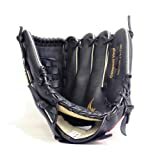 This entry was posted in Baseball and tagged 12'', barnett, Baseball, black, Glove, JL120, outfield, polyurethane, Size by FPSports. Bookmark the permalink.